مقدمه: تحمل پریشانی پایین یکی از مشکلاتی است که ناباروری، بر زوجین تحمیل می‌کند. 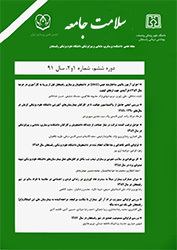 زوج‌درمانی هیجان­مدار از جمله مداخلاتی است که در سال‌های اخیر در درمان مشکلات روان‌شناختی زوجین نابارور مورد استفاده قرار گرفته است، به همین منظور پژوهش حاضر با هدف تعیین اثربخشی زوج‌درمانی هیجان­مدار بر تحمل پریشانی زوجین نابارور شهر اصفهان انجام شد. مواد و روش‌ها: پژوهش حاضر از نوع نیمه تجربی می‌باشد که با استفاده از طرح پیش‌آزمون- پس‌آزمون با گروه کنترل انجام گرفت. جامعه آماری این پژوهش شامل کلیه زوج‌های نابارور مراجعه‍کننده به مراکز ناباروری شهر اصفهان در سال 1394 بود که با روش نمونه‌گیری در دسترس انتخاب و به صورت تصادفی در دو گروه آزمایش و کنترل (20 نفر برای هر گروه) جایگزین شدند. هر دو گروه پرسشنامه تحمل پریشانی سیمونز و گاهر (2005) را به عنوان پیش‌آزمون تکمیل کردند. پس از هشت جلسه‌ زوج‌درمانی هیجان­مدار طی چهار هفته، مجدداً پس‌آزمون اجرا شد. داده‌ها با استفاده از روش‌های آمار توصیفی شامل میانگین و انحراف معیار و آمار استنباطی شامل تحلیل کوواریانس تک متغیره 20 مورد تجزیه و تحلیل قرار گرفتند. یافته‌ها: نتایج آزمون تحلیل کوواریانس تک متغیره نشان داد که میانگین گروه آزمایش نسبت به گروه کنترل از مرحله پیش‌آزمون (37/29) به پس‌آزمون (13/33) افزایش یافته است، بدین ترتیب این مداخله باعث ارتقای تحمل پریشانی زوج‌های نابارور شده است (001/0 p=). نتیجه‌گیری: با توجه به اینکه اجرای زوج‌درمانی هیجان­مدار، تحمل پریشانی زوج‌ها را افزایش داده است، این مداخله به منظور بهبود تحمل پریشانی زوج‌های نابارور توصیه می‌شود. Introduction: Infertility imposes various problems on infertile couples including low distress tolerance. Recently, emotional focused therapy is one of the interventions that has been used to treat psychological problems of these couples. Therefore, this study aimed to determine the effectiveness of emotionally focused therapy on distress tolerance in infertile couples in Isfahan city. Materials and Methods: The present study was a quasi-experimental design with pre- and post-test measures and two groups (experimental and control). Using available sampling method, 20 infertile couples are selected among all infertile couples referred to the infertility centers in Isfahan city in 2015. They were then randomly divided into two groups of 10 couple. Both groups completed Simons and Gaher distress tolerance questionnaire (2005) as a pre-test. The experimental group received 8 sessions emotionally focused therapy for four weeks prior to performing post-test. Data analyzing tools were descriptive statistics including mean and standard deviation and inferential statistics including multivariate analysis of covariance. Results: The results of the study showed that in the experimental group, the mean of pre-test was increased significantly from 29.37 to 33.13 in post-test (p= 0.001) compared to the control group. Conclusion:According to the result of the present study,emotionally focused therapy may improve distress tolerance and can be recommended to infertile couples. Ramírez-Uclés IM, Del Castillo-Aparicio M, Moreno-Rosset C. Psychological predictor variables of emotional maladjustment in infertility: Analysis of the moderating role of gender. Clínica y Salud 2015;26(1):57-63. Leyro TM, Zvolensky MJ, Bernstein A. Distress tolerance and psychopathological symptoms and disorders: a review of the empirical literature among adults. Psychological bulletin 2010;136(4):576-600. Zvolensky MJ, Bernstein A, Vujanovic AA. Distress tolerance: Theory, Research, and Clinical Application. 1nd ed. New York: Guilford Press; 2011: 96-7. Simons JS, Gaher RM. The Distress Tolerance Scale: Development and validation of a self-report measure. Motivation and Emotion 2005;29(2):83-102. Repokari L, Punamäki R-L, Unkila-Kallio L, Vilska S, Poikkeus P, Sinkkonen J, et al. Infertility treatment and marital relationships: a 1-year prospective study among successfully treated ART couples and their controls. Human reproduction 2007;22(5):1481-91. Aarts J, Huppelschoten A, Van Empel I, Boivin J, Verhaak C, Kremer J, et al. How patient-centred care relates to patients' quality of life and distress: a study in 427 women experiencing infertility. Human Reproduction 2011;27(2):488-95. Tabachinck BG, Fidell LS. Using multivariate statistics. 6 nd ed. Boston: Person Education; 2013: 97-98. Gratz KL, Roemer L. Multidimensional assessment of emotion regulation and dysregulation: Development, factor structure, and initial validation of the difficulties in emotion regulation scale. JPBA 2004;26(1):41-54.